Legends of the High Seas is a new pirate game soon to be released by Warhammer Historical. By all accounts, the game is skirmish scale played campaign style using a variant of the Lord of the Rings game system. I was a big fan of Mordhiem when that game first came out and look forward to the same sort of gang/crew development that takes place over a series of games. On top of the excitement over getting to be a pirate, I will be assisting the author – Tim Kulinski– run LotHS demo games at Adepticon 08. To stay on top of all the updates visit the Yahoo High Seas group. 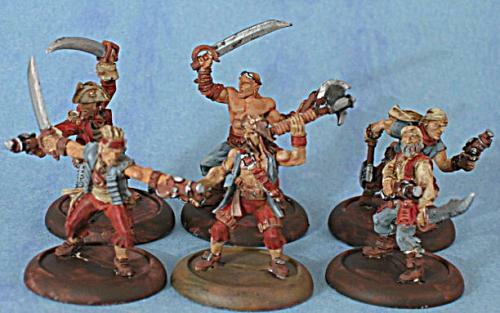 The first batch of pirates for the demo games are the Sea Dogs from Privateer Press. At this point, I’m going to call the crew a work in progress. One of the “problems” with photographing your miniatures is that every flaw and missed spot jumps out of the pic and screams for your attention. The faces need a bit more attention and I see little bits of under coat peaking out.